On September 26, 2011 the NYU Stern Center for Global Economy and Business, led by Professor Kermit Schoenholtz, hosted Dr. Duvvuri Subbarao, Governor of the Reserve Bank of India. Subbarao discussed India’s economic opportunities and challenges, noting that inflation in the 4-6 percent range is the short-term comfort range, down from the current 9 percent. He said that monetary policy is becoming the only line of defense and that Central banks do not have textbooks solutions. 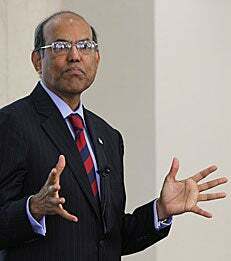 Subbarao also stated that communicating guidance is as important as the guidance itself, citing the US Fed as a good example. Central bank policy must be stable, transparent and predictable, he reiterated, because uncertainty is not good for markets. The Center for Global Economy and Business aims to promote faculty research at Stern. It houses several research groups that explores the global aspects of modern economies and business. The Center serves Stern and the University through outreach to the broader community, including the academic, business, and policy worlds, as well as students and alumni.